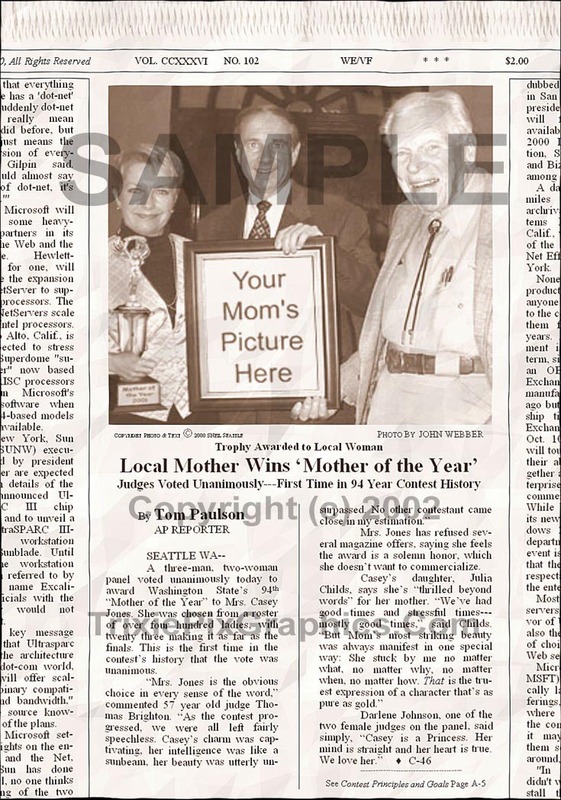 A three-man, two-woman panel voted unanimously today to award Washington State's 94th "Mother of the Year" to Mrs. Casey Jones. She was chosen from a roster of over four hundred ladies, with twenty three making it as far as the finals. This is the first time in the contest's history that the vote was unanimous. "Mrs. Jones is the obvious choice in every sense of the word," commented 57 year old judge Thomas Brighton. "As the contest progressed, we were all left fairly speechless. Casey's charm was captivating, her intelligence was like a sunbeam, her beauty was utterly unsurpassed. No other contestant came close in my estimation." Mrs. Jones has refused several magazine offers, saying she feels the award is a solemn honor, which she doesn't want to commercialize. Casey's daughter, Julia Childs, says she's "thrilled beyond words" for her mother. "We've had good times and stressful times---mostly good times," said Childs. "But Mom's most striking beauty was always manifest in one special way: She stuck by me no matter what, no matter why, no matter when, no matter how. That is the truest expression of a character that's as pure as gold." Darlene Johnson, one of the two female judges on the panel, said simply, "Casey is a Princess. Her mind is straight and her heart is true. We love her."